Family of Tamanna : Father Santhosh Bhatia & Mother Rajni Bhatia. Education of Tamanna : National College, Mumbai. As soon as completing her +2 she has taken BA through distance education as she is busy with the films having no time to attend the regular classes. Tamanna Bhatia entered into her teens and movies at the same time and has worked in some successful Tamil and Telugu movies.She also has experience as a model and has appeared in ads for Rajmahal Silks, Saravana Stores and Shakti Masala. 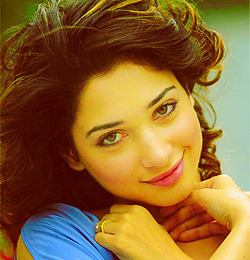 Tamanna Bhatia got her first movie offer when she was thirteen. It was a Bollywood movie called Chand Sa Roshan Chehra (2005).She found success with her Tamil debut Kedi (2006). The Telugu movie Happy Days (2007) was commercially successful. Her Tamil release Kalloori (2007) earned her a nomination for the Filmfare Best Tamil Actress Award. She has craze on white colour from her school days. Day by day, it developed. She says the term Simple and Grand suits two things – one is White colour and the other is Tamannah in white dress.When Tamannah and her brother have fun together, sweet home becomes terror home. She earned her first salary at the age of 13 for acting in an ad. She gave treat to her family with that money at 'Coffee Day'. As Coffee Day was somewhat costly 7 years ago, her first salary was fully spent (gone!) but that happiness still remains in her heart. 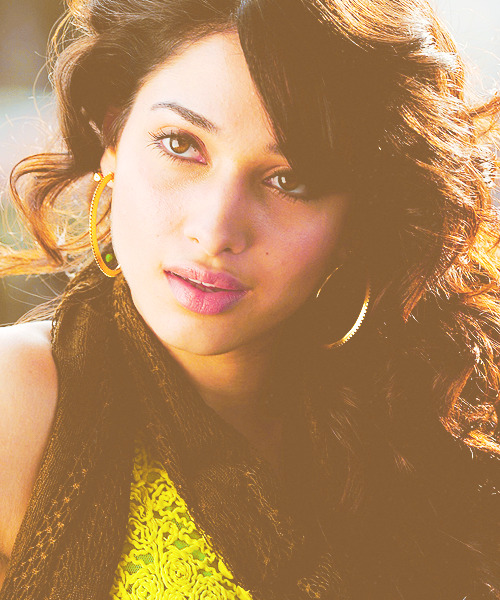 Tamanna is in love now.Tamanna is in love with Siddhartha. 1. "I don't have any dream roles. But I prefer performance oriented roles and I love acting." 2. "I'm glad that people have so much of good things to say about me. There are certain films that can take you to stardom at one shot. I'm glad to have gained stardom with both Happy Days and Kalloori. God has really been kind to me. I forever cherished the dream of becoming an actor and I'm happy that finally I've had my dream come true."